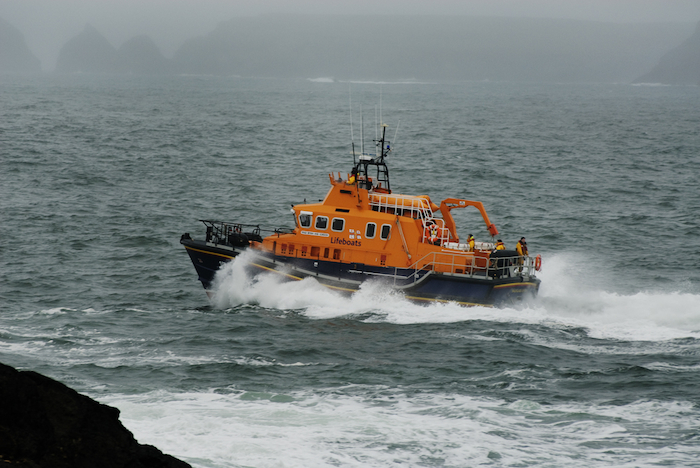 Volunteers from Ballyglass RNLI spent 11 and half hours at sea on Monday to bring three fishermen to safety. The lifeboat crew were requested to launch their all-weather lifeboat at 4am on Monday, December 3 following a request from the Irish Coast Guard to go to the aid of three fishermen onboard a 10m vessel that had got into difficulty 38 miles from Ballyglass. The lifeboat under coxswain James Mangan and with four crew members onboard, launched immediately into the darkness and made its way to the scene and into Donegal Bay. The fishing boat had got into difficulty when it fouled its propeller. Weather conditions at the time were good and when the lifeboat crew arrived on scene they assessed that all on-board were safe and well before working with the fishermen to establish a tow-line, and then began the slow journey to Killybegs where they arrived at 10.30am. Following a short break for breakfast, the lifeboat crew made the return journey back to Ballyglass, arriving at the lifeboat station and preparing the lifeboat for service again at 3.30pm. Speaking following the call out, Padraic Sheeran, Ballyglass RNLI Lifeboat operations manager said: "The fishermen did the right thing this morning raising the alarm when they got into trouble and we were delighted to be able to help them return to shore safely. "This was an early morning call out for our volunteers who got out of their beds to respond to their pagers and make their way to the scene. Given where the boat had got into difficulty in Donegal Bay, by the time we reached the scene and towed the vessel safely into Killybegs and made the passage back, our crew had spent 11 and a half hours at sea. Page generated in 0.1449 seconds.